Dominion Voltage Inc.’s Conservation Voltage Reduction (CVR) system has the potential to cut U.S. electricity consumption 2-4% for relatively little cost. The EDGE technology eases integration of small-scale solar and wind energy sources into the electric distribution network. Dominion expects the market for EDGE to take off as electric utilities invest heavily in grid modernization over the next decade. Powell assembled an ad hoc group to noodle the problem. Working on their own time, they tested their solution on an electric circuit where all the houses were equipped with smart meters. One of those houses, not entirely coincidentally, was Powell’s. From his home, he monitored the neighborhood voltage as people turned their HVAC, lights, TVs, dishwashers and dryers on and off. The technology worked like a charm. Not only did it conserve electricity, but Powell discovered that the system could give a heads-up when customers encountered voltage-related issues. The company could dispatch a crew to fix the problem almost before customers knew they had it. 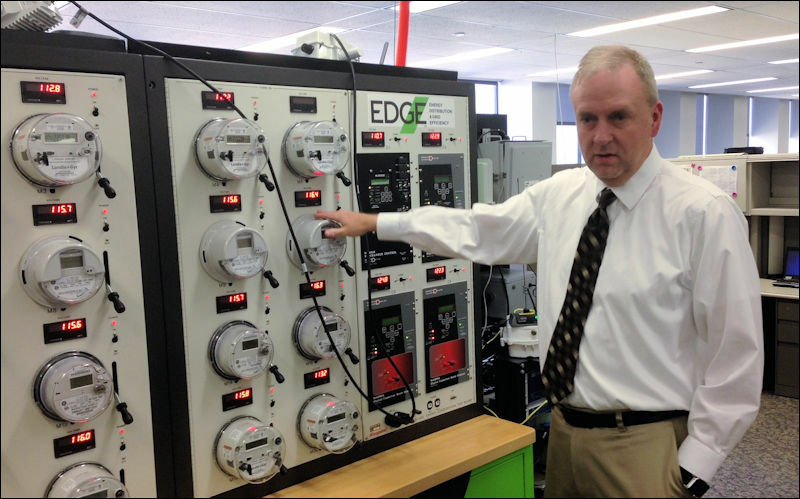 Powell’s tinkering formed the basis of supervisory control and data acquisition product, EDGE, which Dominion hopes will help propel the electric grid into the 21st century. The company sees two vital applications. First, EDGE has the potential to shave electricity consumption by 2% to 4% globally if deployed across utilities’ entire service territories — equivalent to the output of dozens of utility-scale power plants. “This is a great environmental service to the world,” says Todd Headlee, executive director at Dominion Voltage Inc. (DVI), the non-regulated enterprise created to commercialize the product. DVI is doing business in Hawaii, California and other states where there are energy efficiency mandates and solar power is taking off. The company also is pursuing business in Canada, Europe and Asia. where many of its patents have been approved. The Central Lincoln People’s Utility District delivers electricity to about 48,000 customers on the Oregon coast. A beneficiary of the Obama stimulus package in 2009, the municipally operated power company received a $9.8 million grant to install smart metering systems for its customers. Shortly thereafter, engineering manager Bruce J. Lovelin arranged to install DVI technology to help conserve voltage for 1,400 customers. Customers saw a 2% reduction in electricity consumption across the board. The beauty of the investment is that it delivered a savings to all customers, not just those who could afford to spend money installing LED lights or energy-efficient appliances. “This doesn’t distinguish between renters, owners, seniors or whomever,” says Lovelin. The marginal cost of running the software amounted to about one cent per kilowatt hour — a fraction of the 3.5 cents per kilowatt hour it costs Central Lincoln to purchase power from the Bonneville Power Administration’s hydro-electric dams. It’s an even smaller percentage of what it costs most utilities to generate power. Headlee moved to Richmond from Minnesota four years ago, where he had built and sold a company in the smart-meter industry, and then launched and sold an energy-storage enterprise. Dominion recruited him to run DVI. However, gaining acceptance for the product has taken years. One reason is that utilities are only beginning to deploy smart meters on a large scale. The Obama administration helped jump-start the industry with its stimulus package, and utilities have been using smart meters to automate their billing processes. But it has taken further advances in technology to reap the full benefits. Now that utilities have streamlined billing, many are thinking about how to maximize their investment by using the smart meters for CVR and solar integration. Soon, Headlee predicts, smart meters will be ubiquitous. About half the U.S. is wired with them; by 2020, he says, the figure should be close to 100 percent. Another issue is the structure of the electric power industry. Utilities make money by selling electric power. Promoting conservation cuts into revenue and profits. As a non-profit “peoples’ utility,” it was easier for Central Lincoln to justify the acquiring EDGE because it purchased all of its electricity from the outside. If the company sold electricity, it just purchased less from Bonneville. It also didn’t have a public service commission to answer to. But the investor-owned utilities that account for most electricity sales are rewarded for selling more juice and generating a return on investment on the capital invested to supply it. Only 14 states have “decoupled” their rate structures, meaning their profits are disassociated from its electricity sales. Instead, regulators adjust rates so utilities generate no more nor less revenue than required to cover costs and a fair rate of return. Early adopters are states that are resolutely pushing solar power, Hawaii foremost among them. Electricity, generated primarily by oil-burning plants, is the most expensive in the country. The state has set a goal of moving to 100% renewable energy sources by 2030. But the islands have their own tiny electric grids, which means they can’t dish off power to one another when winds die down or clouds float over. For a time, Hawaii had to stop accepting any new solar generation because local grids were getting too unstable. Hawaii first incorporated EDGE into its grid to conserve energy. Soon thereafter it soon realized that the voltage-control system, which reported accurate, real-time data and provided control over voltage regulators, capacitor banks, and load tap changers in its distribution lines, could adapt to wide fluctuations in electricity output. California’s predicament is not as dire as Hawaii’s, but it has been bumping up against the limits of solar capacity. Arizona is another promising market. Meanwhile, DVI is exploring other potential applications, such as controlling voltage at the building level. Here in Virginia, the company has installed EDGE for testing purposes in Fort Myer in Alexandria and Virginia Commonwealth University in Richmond.